England captain Joe Root has called on England to play bold, brave cricket against Sri Lanka in a bid to end to their touring travails. Just 24 hours after Warne confessed his fear over not turning performance into points, the Millers were heading into the bottom three as they trailed 1-0 against the Swans. It looked like their goal difference could also take a hammering as the Welsh side threatened to put the Millers to the sword. But nine minutes of carnage saw Warne's men earn a barely-deserved victory as Ryan Manning fired in two penalties. It provided a first win in almost two months and ensured they ended the weekend in 18th position. And Warne reckons that is a much more realistic position for his side than had they lost the game and slipped to 23rd. “I looked at the league table,” Warne said after the game. “If you took three points off us, we'd be second bottom. My team don't deserve that. “I still think we should have five or six more points than we have on the board. “Saturday was a lesson in how difficult this league is. 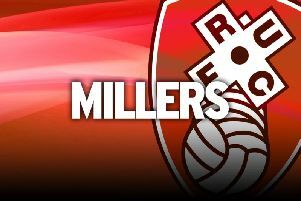 The Millers have had their fair share of gripes with refereeing decisions so far this season, but they could have no complaints about Tony Harrington. The official awarded two spot-kicks in the space of nine minutes, the first for a foul on Jamie Proctor and the second a handball by Leroy Fer. The first one looked generous, something even Warne acknowledged. “I thought the first one was a little bit weak,” he said. "I think Procs got pushed. “At the time, I thought it was a little bit weak. If we had conceded a penalty like that, I would have been disappointed. “The second one - and I'm not trying to be too much of a comedian here - no-one is expecting Will (Vaulks) to hit it so badly. “It was going out for a throw-in. I presume it hit their player's arm. That's definitely a pen then.